Somewhere between the 4-1 mauling of South Korea and the inimitable press conferences, you would have been forgiven for thinking that Diego Armando Maradona was a man hurtling irrefutably towards his destiny. The fortunes of Maradona and the World Cup have been inexorably linked ever since that majestic day in 1986 when he claimed both the ‘Hand of God’ and the greatest World Cup goal ever scored. Crucially though, that was Maradona the player. This, however, is Maradona the coach. So, twenty-four years from the day that a stocky, curly haired young man slalomed his way into enduring memory, a slightly graying 49-year old exited the World Cup in ignominy. For many, a deity had fallen. But the truth is that this was always on the cards. Even in their most comprehensive wins, even in all their pretty patterns and even in all that arrogant back-talk there was always the lingering feeling that this Argentina side, really was not up to scratch. Not that they lacked players in that department. Any side that can leave a Champions League winning goalscorer in Diego Milito on the bench, boasts enough talents to win a trophy. But for every Milito, there was also a Burdisso. And there was really no-one to paper over those cracks. Lionel Messi is easily the best player in the world. But as the World Cup progressed the Barcelona man increasingly started to develop into a sort of talismanic figure for Argentina fans. Any questions about the suitability of the squad were met with the fact that they possessed the best player in the world. But at the end, football is a team game, and as Ossie Ardiles so eloquently put it, ’11 individuals cannot better 1 team.’ Which is exactly what happened in the quarterfinal. The Germans played like a team, each player perfectly complimenting the other. Their movement was impeccable, intelligent and piercing. Every move was worked, reworked and each player knew what the other was supposed to do. Bastian Schweinsteiger, in particular, was impeccable; his passing, distribution and control of the pace of the game completely overwhelming the Argentina midfield. Argentina were set-up all wrong. Messi playing way too far from goal and often dropping into midfield and even beyond to pick up the ball. It was something the Germans were happy to let him do, since when he faced goal he often saw two banks of four infront of him. And even Messi cannot beat them all. The space he so successfully occupies for Barcelona was filled by Carlos Tevez and Maradona’s favorite player was infuriatingly frustrating. All hustle and bustle, but zero output. The exact opposite of Thomas Mueller. The Bayern Munich player’s rise to prominence has been nothing short of astronomical. Just last year he was playing in front of a few hundred spectators in the German third division. In March, Maradona seemingly missed his entire 67 minute debut and thought of him as a ball-boy. On Saturday, he played the integral role in kicking the Albiceleste out of the World Cup. He scored the opening goal and provided a spectacular lay-off for Lukas Podolski to square for Miroslav Klose’s opening goal. Klose bagged another as the Germans ripped the Argentina defence to shreds near the end and his emphatic volley took him to fourteen goals in the World Cup, one short of Ronaldo’s fifteen. With two more definitive games, who will bet against him? This was supposed to be the match of the tournament. The pseudo-final. But Germany turned it into a veritable mismatch and at the end, Maradona’s facial expression was adequate clue as to the spectacularly depleting fortunes of his squad. 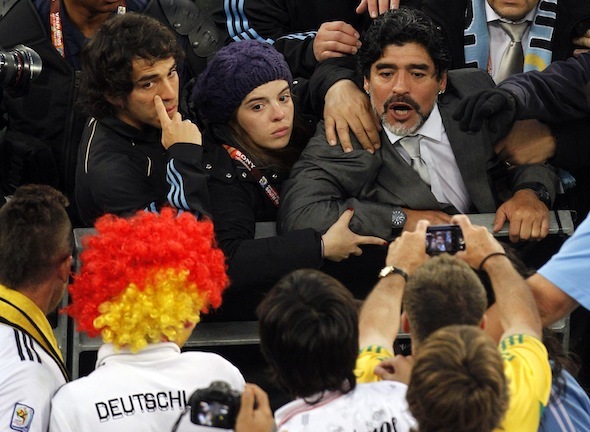 Maradona is crass, undignified and a sore loser, or, charismatic, straight-up and inimitable, depending on who you believe. The truth as always is somewhere in the middle. But he is one of football’s greatest characters. We can’t live with him, but we can’t live without him. What he is not, is a great manager. It is most likely that Saturday was the end of the Maradona’s reign as Argentina boss. And for that Argentina should be thankful. This group of players is far too talented to go to waste under the tutelage of a man such as Maradona. His appointment itself reeked of irrationality and in the end one hopes that the Argentina federation will learn that nothing, not even aspirations of destiny, beats logic. In the end, Maradona’s greatest achievement as a manager was to convince the watching world that his team could win the World Cup. Sepp Herberger’s famous mantra, should drive them on. The best team in the world is next. But then so it was in 1954 as well. And look how that turned out. Manuel Neuer (7): Not the most assured performance from the Schalke stopper. Looked unusually nervous on a number of occasions and messed up a corner. Made a big stop though to redeem himself. Phillip Lahm (8): Probably the best German player on the night. Bailed out the defence on a number of occasions. Not really an attacking threat going up front though, except a few occassions. Jerome Boateng (7): A lot more solid than Holger Badstuber. Held up on the left very ably. But attack wise struggled to make much of an impact since he had to consistently check back on his right foot. Per Mertesacker (4): Awful performance from the Werder stopper. Lost numerous challenges in the air and his positioning was suspect throughout. Really needs to pick up his form. Arne Friedrich (7.5): Bailed out Mertesacker on a number of occasions. Started moves by confidently moving the ball into midfield. Has really grown into this central defensive role. Sami Khedira (6.5): As seems his forte, put in a lot of legwork in midfield. Ran up and down the pitch, covered the most ground and make intelligent forays. Needs to be imposing himself more into games and taking control, but that might be an unfair comparison with Michael Ballack. Lukas Podolski (5.5): Quite shocking from Podolski. Was almost a black-hole in possession and made countless wrong choices; shooting when he should have passed and running when he should have shot. Put in zero crosses, although that might also be a consequent of Germany not playing a traditional center-forward. His 90 minutes on the pitch is a mystery. Thomas Mueller (7): Not as effective as in the Australia match, but still had numerous bright moments and delivered when the going got tough. Made the pass for the Oezil goal and looked to make things happen. Put in a few decent crosses as well. Mesut Oezil (7): Despite his absolutely wonderful goal, Oezil often struggled to impose himself in this game as he tried to free the shackles imposed by the Ghana midfield trio. Missed a glaring one-on-one chance, but redeemed himself later with a goal to savor. Cacau (6.5): Worked his socks off and made several intelligent runs. But not the same threat with his movement as Miroslav Klose is, but that is mostly down to him being more of a second striker than a leading the line player. Manuel Neuer (7): An accomplished showing by the Schalke man. Had little to do in the entire game but when called upon was solid in his handling and distributed well. Holger Badstuber (7): The picture of calm. Good passer of the ball and retained possession well. Defended stolidly, although had little really to contend with. Arne Friedrich (7.5): Mixed it with Garcia and Kewell on a number of occassions. One of the busier German center-backs. Looked solid mostly. Per Mertesacker (7): Quiet, unassuming game considering Australia hardly posed a threat. Lost a few headers and had to make a few risky tackles, but overall never unduly worried. Phillip Lahm (8.5): Captain’s performance. Combined brilliantly down the right. 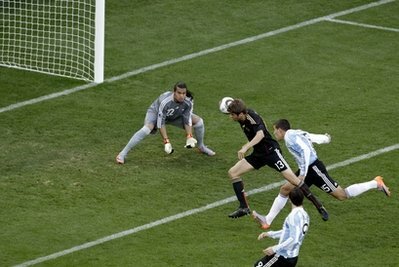 Set up Klose’s goal with a great cross and rarely beaten to the ball by an Australian man. Lukas Podolski (8): Willing runner, came short to get the ball. Whipped in dangerous crosses and played some super pases. Overall, this was the Podolski of old. And what a shot for the goal. Bastian Schweinsteiger (8): Stepped admirably into Ballack’s shoes. Retained possession with aplomb. The heartbeat of the entire team and not afraid to get stuck in there when needed. Sami Khedira (7): Looked a little lost at the start of the game. Needed to step up to get a good grip on the game and did so in the second half, although the task was made easier by the sending off. Thomas Mueller (8.5): Loew called him cheeky. Super game from Mueller. Ran the line, cut intelligently inside and combined superbly with Oezil and Lahm. And took his goal superbly. My man-of-the-match. Mesut Oezil (8): Classy in everything that he did. The complete playmaker. Germany have not had a player like him in ages. Insightful, intelligent and with superb vision and balance. The complete playmaker. Now just has to improve his finishing; and cut ot the diving. Miroslav Klose (7): Got his goal, but missed glaringly. Made some good runs that troubled the Australians and as always an unceasing worker. 11 goals in the World Cup now, 7 with headers. Super record. Cacau (7.5): A goal within one minute and 52 seconds of coming on. Took his first chance and generally combined well. Booked for diving and deservedly so. Gomez (6): Did little of note, but in truth the service was lacking as Germany took it easy by that time. Had one chance from a Marin cross, did not make much of it. Germany are tactically mobile, but is Loew? On paper, this Germany side has six forwards and two central midfielders. Four center-backs but just one specialist left back. Madness is what immediately comes to mind. But Joachim Loew might just have some method in his thinking. Modern football is all about multi-functional players, operating in a system that is dynamic and can easily shift from one to another. And in that regard, Loew’s Germany side are a highly efficient bunch. The point is best illustrated with the case of Thomas Mueller. The Bayern Munich man can challenge Miroslav Klose/Mario Gomez/Cacau to play up front, Stefan Kiessling/Piotr Trochowoski to play on the right and Lukas Podolski/Marko Marin for a spot on the left. Mueller has been used in all of those positions this season by club coach Louis van Gaal, and he was even used as an advanced player in a midfield three, a role that does not exist in Germany’s current tactical setup. Despite this ability to fit in almost anywhere, Mueller will probably be on the bench for Germany’s first game against Australia on Sunday. Which begs the question, as to why? This is because most of the other players in the Germany squad are almost as multi-functional. Toni Kroos for example, is the ideal replacement for Mesut Oezil in the central playmaking role, but he is a more likely replacement for either of the two central midfielders if they get injured/suspended. He can also play on the left. Staying in midfield, while Schweinsteiger is a lock for the midfield spot, he has played the vast majority of his games for Germany either on the left or on the right. Podolski can play as the central striker but looks set for the left. And in defence, this multi-position capability is even more evident. Phillip Lahm can play right or left back, Friedrich right or center back. Boateng mirrors the latter, while Badstuber is the inverse – he plays center and left back. But Denis Aogo is the most interesting. The Hamburg man, will probably be Loew’s fall-back solution for the central midfield spot, and the fact that he has Kroos to share that burden with is why Loew, probably did not call up a replacement for his several injuries. The questions that remains is whether having such squad flexibility is really helpful? Most coaches would tell you that such an option is an ace-in-the-hole. Each person brings unique qualities to the position they play and this adds to the overall unpredictability of the team, making them harder to plan and play against. Having such an option greatly increases the chance of making swift, but subtle tactical changes that can affect the result of a game. But in order to do that, you need a tactically astute manager, who is quick on his feet and brave. And while Loew is certainly the former, he is yet to convince most that he possess either of the latter two qualities. is Loew fast enough on his feet? An impressive 3-1 win over an attacking Bosnia side on Thursday showed that Joachim Loew’s multi-cultural Germany still retain the traditional fighting qualities, that make them so dangerous in World Cups. At the risk of reading too much into a friendly match, Germany fell behind to an unfortunate goal, courtesy of a mix-up in the backline. Phillip Lahm’s attempted clearance rebounded off Edin Dzeko into the net. But captain Lahm made amends soon after with a sparkling goal and his deputy Bastian Schweinsteiger added two penalties to give the scoreline a comfortable feel and only what it deserved. The Bosnians were poor defensively but had good quality going up front with Dzeko, Miralem Pjanic and Zvezden Misimovic in the side. Looking at friendly results around the continent and beyond, Loew will be quietly pleased at the preparation and bonding of his squad even as they are missing Michael Ballack. 1. The attacking foursome of Cacau, Marin, Oezil & Mueller in the second half were hugely impressive. Although it might be a light-weight option and Podolski will probably play ahead of Marin, it is good to know that Germany have so many talented creative players to fall back on if they are chasing a game. 2. Phillip Lahm’s stunning goal and his overall play suggests that the captaincy is only a natural step up for him. The perfect man for the job. 3. Bastian Schweinsteiger is rapidly maturing into a ball-playing central midfilder of some repute. It is he, and not Sami Khedira who will be the real replacement for Michael Ballack. 1. Miroslav Klose looks desperately out of touch. The Bayern man will need to get his touch back and soon. Loew’s comments however suggest that the Bayern man will line up against Australia for their World Cup opener. 2. It is difficult to understand the role of Stefan Kiessling in this team. Cacau is the fluid forward, Klose is the aerial threat and hard worker and Mario Gomez is the strong physical presence. Where does Kiessling fit into all of this?